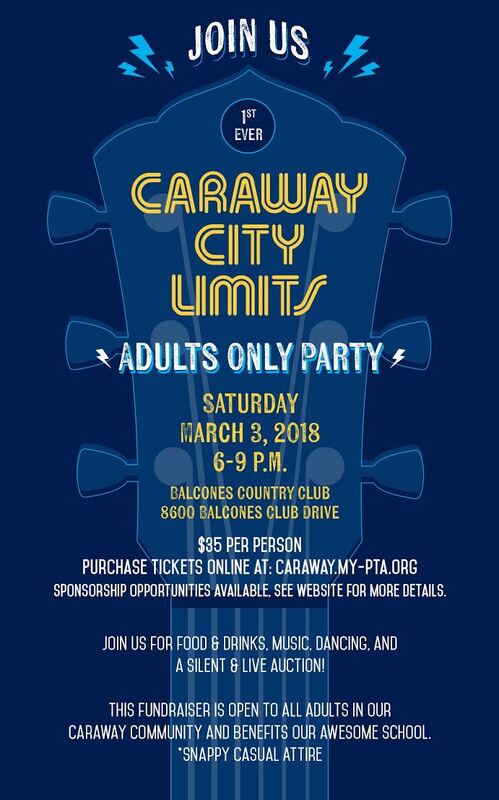 Join us for the first-ever ADULTS ONLY party and auction. It's going to ROCK! There will be dinner, cash bar, music and dancing, a silent auction, and a live auction featuring a week of overnight camp at Pine Cove (a $1,199 value) and artwork created by our kids! All proceeds fund PTA programs at OUR school for OUR kids. · Family Sponsorships are $150 and include 2 tickets, a Caraway yard sign and a Caraway swag bag. · Table Sponsorships are $350 and include reserved seating for 8 and sponsorship recognition. · Teacher/Staff Sponsorships start at $35 and can be gifted to a specific teacher or staff member. They can also be given anonymously to anyone who has requested to join us for this special event.